The carpets are cleaned, the desks are meticulously polished, the pencils are sharpened, and the lockers (cubbies) are vacant, waiting to be occupied by a backpack full of contents. 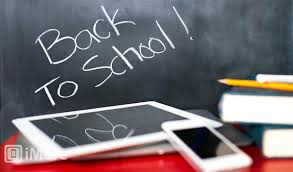 The next few weeks (at least in the state of Arizona) mark the beginning of another school year. A time when teachers return with a sense of hope and rejuvenation, following a much needed break from the controlled chaos of the previous school year. For students, however, this time of year can often be characterized by feelings of dread, worry, or even anxiety. As they drag themselves out of bed on that first day, memories of sleeping in or the rotating schedule of sleepovers remain fresh in their minds. Near the top of the list, in terms of preparing students for a new school year, is the all-important supply list. Each school is different, but the bulk of this list has remained constant for years. Pencils, paper, notebooks, and folders are an absolute necessity for any student. As parents frantically race through the Back To School aisles of Target or Walmart, looking to check off that final item on the list, there’s another list that lurks in the background. I refer to it as the mental toolkit. It’s not something you’ll find at a store, nor will your school provide you with a comprehensive list of mental tools. This makes it even more difficult to obtain. You see, as students arrive at school on the first day, armed with backpacks full of supplies, they also bring another backpack with them, which will play a much more important role in their academic and personal success – their mental backpack. Below is a list of three important tools that I encourage you share with your child prior to his first day of school. Tool 1 – Your mindset will determine the quality of your school year, NOT your classes, your teachers, or your peers. It’s almost certain that you will experience a series of difficult circumstances this school year. Whether it’s a boring teacher whose monotone delivery lulls you into a nap-like state, or a demanding class that keeps you up into the wee hours of the morning, no student is immune to challenges. If you’re looking for the easy route, you are more than welcome to complain about the challenge. You can even blame the teacher for his/her boring delivery or make numerous excuses for your poor grade, but the fact remains that complaining, blaming, and excuses will never change anything. Simply put, your circumstances don’t determine your levels of happiness. The way you see your circumstances does. I invite you to be curious about how these challenges can shape you for the future. No one ever reached success without a series of struggles. If you learn to embrace the struggle, the journey will be much more meaningful. Tool 2 – Always be aware of your internal dialogue. You can train your mind to be positive. Here’s a little known fact that most students don’t even consider – you talk to yourself all the time. Your mind is like a thinking machine, designed to help you make sense of the world. As is the case with every human being, a portion of these thoughts are going to be negative. I invite you to practice being aware of your thinking and when you notice a negative thought, simply replace it with a positive one. Imagine each of your thoughts as either feeding the negative dog or the positive dog. The more you feed the positive dog, the more positive you’ll be. By the way, don’t expect your thoughts to change overnight. Change happens over time. Tool 3 – Your success in life will not be based solely on your grade point average (school smarts), so spend some time developing your self-smarts as well. If you commit to practicing these three tools throughout the year, I promise you it will be your best year ever.